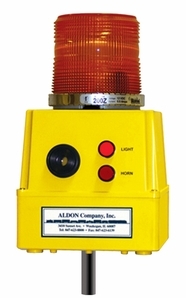 Flashing amber light and loud horn alert workers that a car is in motion. Compact unit mounts to hole in coupler. When car moves, light and horn are instantly activated. When car stops, light and horn will continue active for about two seconds. High impact polystyrene housing and steel mounting prong. Powered by eight AA batteries. Rain and dust proof.